In India, digital governance regime has brought with it a mixed bag of opportunities and teething pains for the citizenry. On one hand, there is much to be appreciated about a move to the digital. Digital service delivery solutions make sense in a socio-economic scenario where the marginalized deal with innumerable barriers to accessing their entitlements and rights, whether it is an apathetic bureaucracy insensitive to the survival needs of the poor or the countless intermediaries who eat into their dues. Technology can, in theory, bring efficiency, cut down on time costs spent in queues and reduce ambiguities and corruption for beneficiaries. However, in the past few years, the ad-hoc experiments with digital governance point to a very different picture – one in which technology becomes yet another paradigm of subjugation, disciplining and exclusion which invariably hurts the most vulnerable. Governance by networks and rule by data have increasingly meant a state in which human discretion is replaced by automation, private parties take over public sectors and the provision of welfare becomes an exercise in efficiency management. In order to examine and discuss these shifts in our contemporary democratic fabric, a workshop that focused on emerging technological practices in government and their implications for citizenship was held in November 2016. Titled, ‘Democratic Accountability in the Digital Age’. 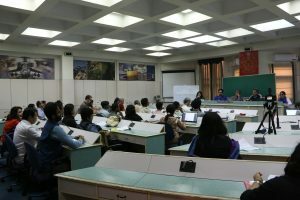 The workshop was organized by IT for Change, the Centre for Internet and Society (CIS), the Digital Empowerment Foundation (DEF), the Mazdoor Kisan Shakti Sangathan (MKSS) and the National Campaign for People’s Right to Information (NCPRI). The goal of the workshop was to explore the above discussed concerns and move towards a set of principles to enhance and preserve participatory democracy in the digital age. The workshop also aimed to bring together a coalition that could take the work forward in concrete and actionable ways to widen the public debate in this regard and influence government. Spread over two days, the workshop included a range of panel presentations, discussions and deliberations where a range of digital governance issues were presented, unpacked and contested. These included issues like welfare service delivery under the JAM (Jandhan Aadhar Mobile) model, the need for a robust data governance framework in India, smart cities and the introduction of new institutional arrangements in public administration. 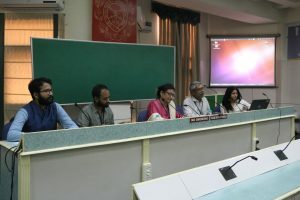 The opening session, ‘Democracy in Digital India: What is at stake?’ was headed by Nikhil Dey from MKSS, Usha Ramanathan, an independent researcher, and Sumandro Chattapadhyay from CIS. Moderated by Parminder Jeet Singh from IT for Change, the panel discussed the impacts of the transition to a digitalized, data-based governance paradigm from the standpoint of democratic accountability and citizen-rights. The panel recognized the need to understand the dynamics of technological change and challenge the assault on welfare. The lack of liability on part of the government in Aadhar enabled systems, including the fact that there were no safeguards against denial of entitlements and services due to errors/failures was highlighted by the panel members. Usha Ramanathan also pointed out that in the context of Aadhar, privacy was becoming a red herring that could be leveraged to benefit private control and limit transparency. Examining the JAM platform, and the fin-tech industry it has given rise to, Sumandro Chattapadhyay observed that profit shells were being coded as ‘nonprofits’ and in the guise of volunteerism, a revolving door for technocrats had been created that goes back and forth between corporations and government through initiatives such as India Stack and iSPIRT. Nikhil Dey argued that there was a need for digital systems that opened up everything about the government to the citizens for their scrutiny, and a system that ensures downward accountability. In his lecture on ‘What is new about the new governance paradigm?’, Prabir Purkayastha, from the Society for Knowledge Commons, spoke about the shift to digitalized governance and what it meant for the larger relationship between the state and the citizen, unpacking concepts such as ‘rule by data.’ Defining data as social relations, he made the point that commodification of data was in fact commodification of social relations. In this context, our responses within the context of a nation state framework were inadequate to curb, control or question transnational data monopolies. While contending that technology was out of social control, Prabir cautioned against activists cultivating a Luddite approach as a response. The fights against exclusions in biometric welfare, he concluded had to be linked to the bigger fight for shaping the politics of technology. The session ‘Citizen engagement in technocratic times’, focussed on citizen participation in the context of digital governance and the potential for such interactions to be transformative. The panel saw presentations by Shankar Singh from MKSS, Rajendran Narayanan from the Program for Liberation Technology, Amber Sinha from CIS and Deepti Bharthur from IT for Change and was chaired by Sejal Dand from ANANDI. Stressing on the need for accountability and human discretion, Shankar Singh argued that technology has no accountability to people, and grievance becomes just another number instead of the articulation of voice. Building on this, Rajendran Narayanan shared the work done by the program for Liberation Technology in Telengana, and made the case that technology could be a tool in the hands of pro-active citizens, but could not be the solution for accountability in and of itself. In his talk, Amber Sinha, using the example of predictive policing argued how Big Data in governance practices assumed neutrality but actually amplifies existing societal biases because it operates on existing knowledge systems. In our presentation from IT for Change, we discussed some highlights from the Voice or Chatter project to talk about the ways in which a certain value bankruptcy of concepts such as transparency, openness, participation had occurred through their co-option in the digital paradigm that had done little to further the cause of deliberative democracy. We highlighted the paradox of statist technospeak, pointing to how policies for ‘openness’ and open data may comfortably sit with state intolerance to dissent. In the session ‘Governing the Smart City’, Kshithij Urs from Action Aid and Swapna Sundar from IP Dome offered legal and governance based perspectives on private party involvement in the administration of urban spaces, drawing from their work in the cities of Bengaluru and Chennai, respectively. Noting that the vision of Smart Cities is connected to India being the third largest market for PPPs, Kshithij Urs spoke about the fact that urban governance had left no voice for urban residents, given that increasingly, public utilities were being taken out of public hands. In the smart city discourse, he asserted that development had become a technicality and participation a form of tyranny in itself. Swapna Sundar in her presentation, discussed the underlying technologies of smart city projects, most of which were patented and inaccessible to the Indian Government. Given that there are no firm technology transfer agreements in place, she demonstrated how smart cities were likely to create an unbroken chain of dependence on private platforms such as IBM and Cisco. The second day of the workshop opened with a context setting panel titled ‘Back to the basics – first principles for democratic accountability in the age of digitalized governance.’ The session included short talks by Osama Manzar from DEF, Rahul Sharma from the Data Security Council of India (DSCI) and researcher, Anupam Saraph, and was chaired by Anjali Bhardwaj from NCPRI. The session focussed on what new legal- institutional safeguards, policy frameworks and techno-design principles were needed to challenge and regulate the technologies of governance. Osama Manzar, sharing his views on the issues of access through the work of his organisation, noted that there continued to be pockets of India even today that remained invisible to the colonial systems of bureaucracy, let alone touched by the digital. He stressed on the need for technological choice and adoption that came from the people, rather than as a top-down effort. Rahul Sharma, in his presentation, gave an overview of the evolution of data security guidelines in India noting the ways in which data was becoming more and more central to political and economic processes. He observed that there were three stages in data governance – From governance of data to governance by data towards governance for Data. Anupam Saraph spoke about the ways in which the layering of fin-tech on the JAM platform needed to be examined with caution, given how Aadhar based transactions, a bulk of which were funds from the public exchequer, could not be subject to financial audit. This view was endorsed by Anjali Bhardwaj, who noted that there was a move to deliberately mystify government through technology and create distance between the government and governed, and to create paradigms of governance that could evade the purview of hard won instruments of accountability such as the Right to Information Act (2005). The later half of the workshop on Day 2 was spent in working towards a set of principles that could form a charter on democratic accountability in governance. Workshop participants met in smaller groups. Each group, following a period of brainstorming, discussion and consensus, brought back a set of principles, which were presented and discussed in the wider plenary. A host of issues were brought to the table and hotly debated – data governance and guidelines, means of enhancing digital participation, countering the clout of private capital in state functions, resolving the ever pertinent questions of basic access and digital literacy. The workshop brought together a range of actors – from grassroots activists confronted with digital exclusions at the margins, to scholars engaging with the issues in institutional settings, to practitioners pushing back against a technocratic takeover of peoples’ democratic rights in critical and important ways, and several others. While attendees had differing takes on the issues at hand, a sound, well rounded framework that addresses the gaps and issues in digital governance in India was recognized as an immediate imperative. The groundwork laid at the workshop was acknowledged as an important starting point, but it was also noted that there was more work to be done in this direction. The Charter on Democratic Accountability in the Digital Age is a step to consolidate the emerging dialogue on data governance/ data in governance. As a document, it was born out of the group discussions and debates in the November workshop. But it is also a product of our larger research and advocacy efforts through the Voice and Chatter project, co-created with our partners and coalitions, and is informed by a year of sustained engagement with various aspects of citizen voice, technology mediated governance and the larger question of the future of deliberative democracy. A draft version is currently available on Google docs. We invite people to review, comment and offer their views on the document. Over the next several weeks, as we share final outputs from the project including state-of-the-art reports, policy briefs and case studies, we will be moving forward on the charter, finalizing it through more debates and discussions, creating what we believe will be a comprehensive framework on digital governance in India.